TAGLINE: "The Outlaw D.J. that turned L.A. Everyway but Loose!!" Tricked out vans, CBs, Ted Nugent and pirate radio stations are all the mix for this end of the decade flick that's still very much a creature of the 70's. The Sebastian's put their usual T&A exploitation in the backseat for a more teen friendly ride this time. 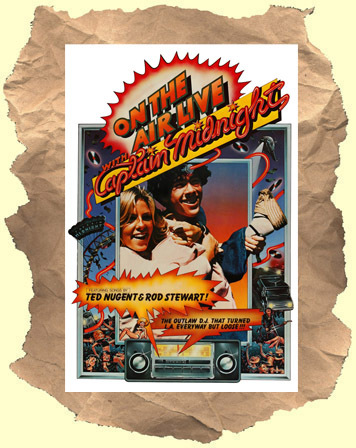 Their son Tracy stars as the radio outlaw "Captain Midnight" who gets together with his geeked-out pals to play music they love from a rolling (illegal) broadcast. Hollywood oldster John Ireland plays the FCC agent (do they really have street agents?) eager to shut them down. Harmless fun. Sort of a precursor to the similar Pump Up The Volume.